We recently refurbished a lovely period marble fireplace. 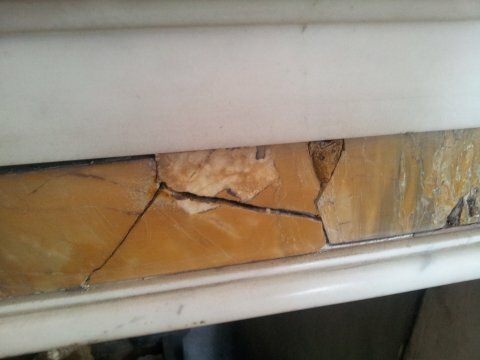 As you can see from the picture, over the years the heat from the fire had damaged the fixings and cracked the marble particularly above the fireplace opening. 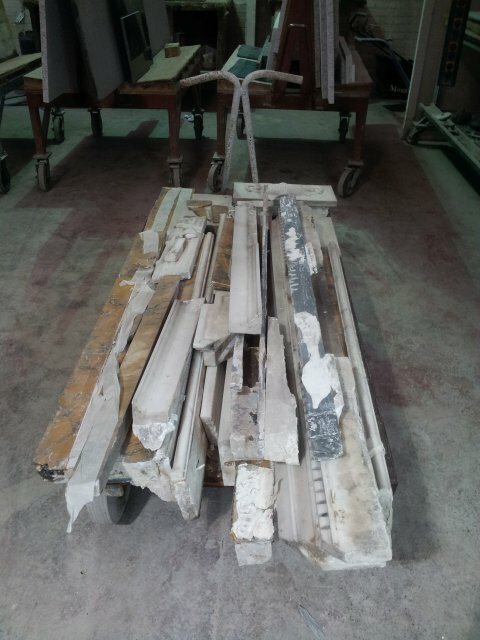 Our client wanted us to repair the piece but was of course concerned to retain the antique nature and feel of the piece. The white marble is Statuary from the Carrara region of Italy. The yellow marble is Giallo Siena. At the time this was made, probably late 18th Century, the Â Giallo Siena had a lovely rich gold hue to it with difnitive streaks of black. This type is now very much more difficult to find. In this case there was no reason to be concerned about sourcing new as the plan was to restore the fireplace with what existed. 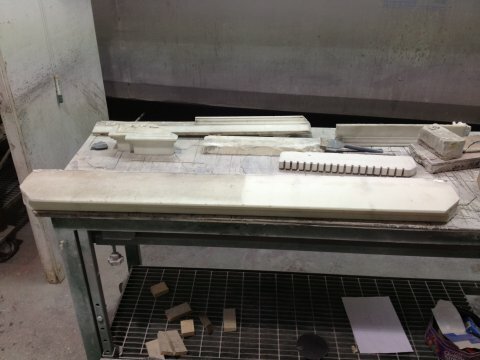 We carefully took the existing piece apart and brought it to our workshops in Durham to rennovate. The repair work started by cleaning all the different sections. Then repairs were made using the specialist glues and techniques of our trade. When the piece was made originally, you can see that the precious Giallo Siena was stuck onto ordinary stone and slate using plaster of paris and other old glues as an adhesive. It would then have been polished on that to create the smooth shiny finish, hence it is so thin. 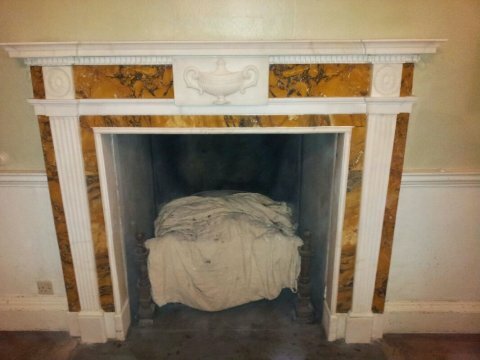 The white mantles and dog toothing were carefully cleaned mechanically. You can see in the picture below the difference between the cleaned section and the uncleaned section of the mantle shelf. The finished piece was then transported back to the customer’s home and carefully put back together. The many sections were dry wired together then grouted. 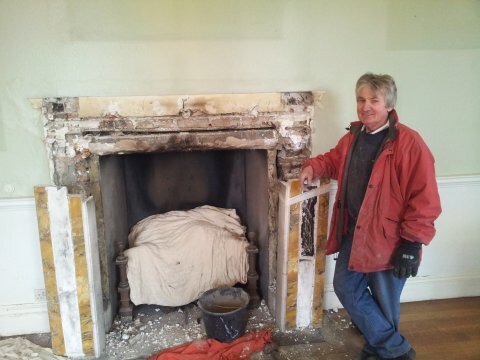 Sometimes we are asked to repair fireplaces that have been moved and installed using modern resins. 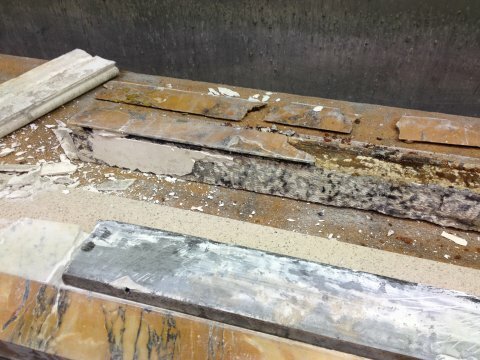 This can make the job of removal more difficult as the sections are much more likely to break and crack as the resin is sometimes tougher than the stone causing the actually marble to crack. Â This should be avoided. Here you can see the final repaired piece back in situ. We were able to do all this without damaging the surrounding special wallpaper.